The answer to this question in short, yes. During the American Civil War many New Yorkers were inclined to allow the Southern States to continue practicing slavery in order to increase total output of the largest American cash crop at the time: cotton. 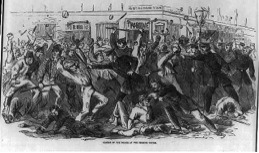 New York was, and has been the epicenter of the U.S.A., and with the onset of a Civil War New Yorkers were not happy. Well, many people were not happy – the nation was about to dive into a horrible conflict, nevertheless cotton provided so much to the New York economy that many people did not see the chance to let it slip away. An estimated $180 billion dollars was defaulted on by Southern industries, infuriating many New York businessmen, and furthering the calls to remain neutral and leave the South alone. Citizens’ calls for neutrality were fueled by the fear of increased job competition in an already deflated economy. Wealthier citizens were able to pay approximately $300 in order to have a substitute take their place in the war, causing anger to reverberate throughout the city, particularly among its robust Irish population – who could not afford to have substitutes. Additionally, racial tensions existed between the Irish, and Free Blacks over competition for jobs. Following the announcement of the Emancipation Proclamation in 1863, many felt that the next stop for Free Blacks would be New York. 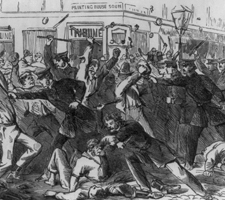 This fear led to the onset of the New York City Draft Riots – the largest civil uprising in American history. Many New Yorkers, predominantly Irish citizens attacked the city’s black population, destroying buildings such as the Colored Orphan Asylum on Fifth Avenue. Reinforcement from the U.S. Government did not arrive until a day later, however the riots continued. The aftermath of this insurrection altered the city’s dynamic. Many Blacks, fearing for their lives fled the city for protection, and the Union gained support from the people of New York. New York was divided even more so on the principles of continuing war with our own. Peace Democrats, fueled by their own intentions of job preservation, and maintenance of the South’s slave status quo, encompassed the city, compromising a significant portion of the general population. Known colloquially as Copperheads, Peace Democrats were found predominantly throughout the Northeast. Many Republicans used this moniker to compare the intentions of the faction to that of a venomous snake, representative of wanting to ruin the nation by opposing the war. Copperheads adamantly argued to end the conflict through diplomacy, and not violence – a viewpoint that many saw as futile and weak. Ultimately this faction acquiesced after the Confederate capture of Atlanta, prompting the Union to become predominantly pro-war. Another faction existed within the Democratic Party – War Democrats – who called for war and supported the efforts of President Lincoln. As you can see, The City of New York was not entirely supportive of the American Civil War, and for the most part did not even want it to take place, no matter what the cause was for. Through conflict, and diplomacy, New Yorkers finally supported the efforts of the country, providing unity behind the Union’s cause, and rejoiced when the Union had finally won the ideological conflict.